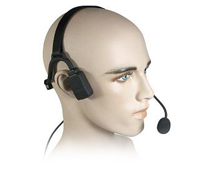 "PATRIOT" SPM-1400 Series - Light Weight Headset: Behind-the-head headset with noise-cancelling boom microphone and earphone. Can be upgraded to TACTICAL or QD version. 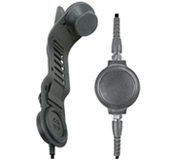 DEFENDER Series SPM-1200D - Lapel Microphone: Lapel Microphone with D-loop style earphone. Can be upgraded to TACTICAL or QD version. GLADIATOR SPM-1500 Series - Heavy Duty Throat Microphone. Dual microphone elements pick up sound directly from users throat, so very little ambient noise is heard. GLADIATOR SPM-1599 - Heavy Duty Throat Microphone for CELLPHONES and TABLETS. Dual microphone elements pick up sound directly from users throat, so very little ambient noise is heard. 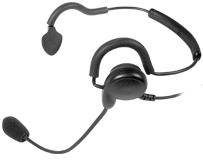 NBP-BH Series - Bone Conduction Headset: Dual-Bone Conduction temple speakers, wrap-around headset and directional, noise reducing, Boom Mic. SPM-1700 Series - Skull Microphone/Headset for CONSTRUCTION Hard Hats: Lightweight in-helmet communications system that mounts to the helmet liner without tools. 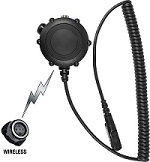 WTX-PTT1500D Series - Wireless Tactical PTT System: Bluetooth Low Energy in Hockey Puck PTT connects to Finger PTT for WIRELESS Transmit Control. 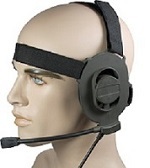 NEW Bowman Style TACTICAL HEADSET. 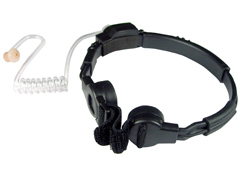 Combat style Tactical Headset with U94 (NEXUS) Plug / NATO wiring format. Use with Tactical PTT such as our PTT-NX4.